It’s a pretty amazing material we’re using to build NRS SUP Boards, our inflatable drift boats, and the GigBob Fishing Watercraft. Other uses for the technology have been floating docks, high-pressure rescue lifting bags and airplane wings! This material lets us build inflatables with flat surfaces that can be inflated to rock-hard rigidity. You get hard-shell performance along with the easy transportation and storage of an inflatable. What makes this possible? Tens of thousands of fine threads. The process starts by joining two pieces of polyester woven support fabric with thousands of fine polyester thread lengths. This base material is made in strips from five to ten feet in width, and up to 400 needle heads may be used in the setup. Each needle sews a continuous, evenly spaced thread, back and forth between the two pieces of woven fabric, locking them together into an incredibly strong unit. These drop-stitch sewing machines are marvels of complexity. When a change is made in the spacing distance between the two pieces of woven fabric, it can take over 20 days to remove and replace the required needles. Next, an air-tight coating is applied to the outer surfaces of both sides of the material. The sidewall material is made of polyester base fabric that is coated on both sides. Polyester thread is used throughout because it is strong, durable and has very little stretch. The actual assembly process involves labor-intensive gluing of the sidewall material to the top and bottom pieces of the drop-stitch material. Then a wide seam tape is glued over each lap seam for a bomber, air-tight final product. What you have now is a super strong construction that can be inflated to pressures up to 20 pounds per square inch (psi). 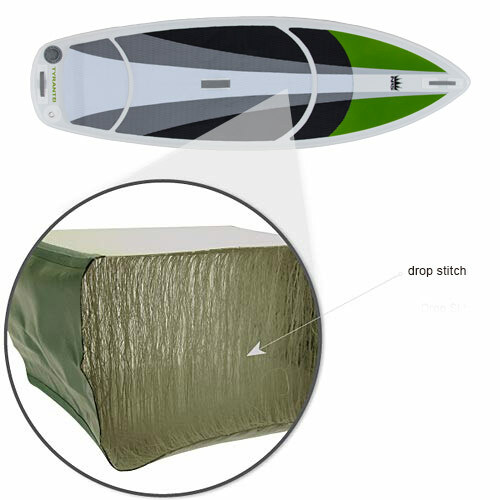 Drop stitch—a high tech material that lets us build new, innovative inflatables that are stretching boating world boundaries. Innovation, NRS-style.